A complete take-along tool. Combines I-Beam technology with a full complement of emergency tools. A complete take-along trail tool featuring I-Beam technology, which is strong, compact and lightweight. Features a full complement of emergency tools: 1.5, 2, 2.5, 3, 4, 5, 6, and 8 mm hex wrenches. 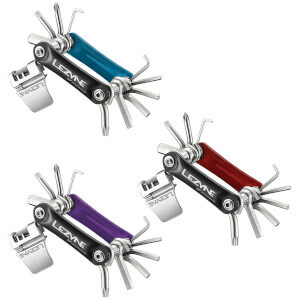 Tyre lever with two integral spoke wrenches. A portable trail side workshop designed to get you out of trouble and back on the bike. It gives me a peace of mind that I have the necessary tools needed when I go out for a ride. This is a superb carry on tool, that is designed with the cyclist in mind. Very light and compact. this one has chain cutter. that's very good option for me. i think the best choice for long distance rider. Other mini-tools have more tools but this one has just the right number that are practically useful out on the road for my bike. It's well-made so its a little heavy. Yes, I'm being overly critical but then again that's the price of independence. I particularly like the tyre lever/ spanner/ key thingy! I bought this tool in case I broke my chain while I am out for a ride. really neat and tidy! the that black thing (tyre lever and chain tool) can lock it onto the tool which is nice and small! Has everything you could possibly need for a road side emergency. The quality of the tools are very high, with an excellent fit and finish.